Eraserheads is a renowned Filipino rock band. It is one of the most famous bands in OPM history. The band is considered as “The Beatles of the Philippines”. They engage in Pinoy rock, Alternative rock, pop music, reggae and Synth Rock. The band was active from year 1989 until the break-up on year 2002. It was formed 1989 by Ely Buendia, Raimund Marasigan, Buddy Zabala and Marcos Adoro. It happened when the two college bands of UP- Diliman, Curfew and Sunday School were looking for new members for their group. Buddy Zabala was the bassist and Marcus Adoro on guitars of the band Curfew. Sunday School’s vocalist and drummer were Ely Buendia and Raimund Marasigan respectively. They met on December on the same year. 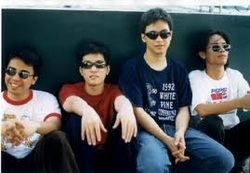 The two bands decided to combine forces and called themselves Eraserheads, after the movie Eraserheads. They did covers mostly until they realized that they are not good in covering other hits so they gave more attention in writing their own materials. Not soon enough, their original songs composed earned recognition. Among them was Pare Ko, a pop song became acceptable among public. On January 6, 1991, they recorded a demo-tape in Raimund’s garage and tried their luck to different record labels but nothing seems interested and rejected them. It may be because it is no pop enough and was made on a cheap tape. On May, Robin Rivera, Humanities professor of UP helped them record a better version of the demo tape. It was called POP-U as a response to those who rejected and turned them down. At the same time, Ely was working with BMG Records at day and wrote songs for the band at night. The songs composed caught the attention of BMG Records and give The Eraserheads a try. In 1992, The Eraserheads was officially signed into contract with BMG Records for three years. In July, the band started recording Ultraelectromagneticpop!, their debut album featuring tracks like Pare Ko, Toyang, Tindahan Ni Aling Nena, Ligaya etc. Walang Hiya Pare Ko, a sanitized version of Pare Ko was also included in the album. BMG releases 5,000 copies as initial but instantly became a smash. 300,000 copies were released by BMG at the end of the year. The album turned sextuple platinum. Philippine Association of the Record Industry (PARI) attempted to oppose and censor Pare Ko but with no success. Thus The Eraserheadsmania was born. On October 1994, a follow-up album entitled Circus was released still under BMG Records. The band said the album described their life after their successful album. The album was said to be unpredictable and unconventional and its styles and moods varied. Band members were considered as good songwriters and musicians. Circus contains songs such as Kailan, Magasin, Alapaap, With A Smile and Sembreak. The album turned gold in 30 days selling almost 20,000 copies but it eventually turned into quintuple platinum selling 200,000 copies. And liken to the first album, it has also its own controversy when Sen. Tito Sotto banned the Alapaap because of its alleged promotion on drug abuse but the band denied it. Another album was launched on 1995 entitled Cutterpillow. It turned to gold in an instance and achieved platinum status several times. The band soon shot the video of Ang Huling El Bimbo from the album. The band even earned international recognition as “Moon Man” in MTV Video Music Awards. In 1996, the band come up with the idea of releasing an EP entitled Fruitcake and was followed shortly by the release of a companion storybook of the same title. Series of gig happened in year 1997. Sentosa Pop Festival in Singapore in March was the band’s first overseas gig. A mini U.S. tour followed on May. Four months after, on September, they received the Moon Man trophy in New York. The Eraserheads is the first Filipino artist to receive such awards. Few days after the said awards, Sticker Happy, their fifth album was released. After a month, a series of shows and performances were held in Singapore for MTV Asia. In 1998, The Eraserheads was chosen to represent Philippines at the annual ‘Asia Live Dream ’98 in Tokyo, Japan. They left Philippines for yet another U.S. Tour on May from Oakland to Los Angeles and to New York under the Happy Box production outfit. On August, Aloha Milkyway was released containing chart-topping songs that have been re-mastered and other five new tracks. The band performed sold-out gig on 1999 in countries like, Hong Kong, Sydney and Dubai. The next album was again released on May of the same year entitled Natin99. Another tour in America took place in between the months May and June, The Pop Machine Tour- USA2000, taking them from New York to Chicago and to California. Two years after from the last album, the band releases Carbon Stereoxide on March 2001. The much-awaited album contains fresh tracks such as Maskara, Playground and Hula. In the middle of March 2002, it was reported and was confirmed that Ely Buendia, band’s vocalist left the band. According to an interview, Buendia had some miscommunication with a roadie when he was late for some time at a male gig. Buendia was disgusted when he discovered that three of his members believed in the roadie. He felt being betrayed and confirmed his quitting through SMS. Without much ado, the three remaining members decided to pursue and continue the band. They look for another vocalist and in just few weeks they are able to introduce Kris Gorra- Dancel as the band’s new vocalist. However, Adoro left the band after few months and the remaining members called them another group as Cambio with another members, Diego Mapa and Ebe Dancel.